Manufactured in Grande-Bretagne from Circa 1920 until after 1920. This model (designated “Aluminium Ensignette De Luxe” in the McKeown) is one of the last and most improved Ensignette models. Its lens is an F6.3 Claror by optician Clément, and a linear speed setting is available on the front ; available speeds go up to 1/100. To be found here is the usual ease of handling of the Ensignette series, in particular finger catches to deploy the camera or open the back. The tilting viewfinder is actioned by a small spring rod which triggers its rotation. This is quite handy, even though the finder will pinch your finger in the process ! 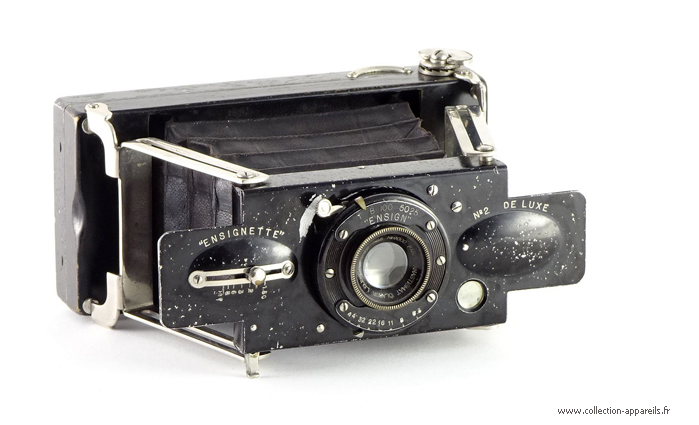 This handsome camera, by Swedish designer Magnus Neill, still works normally.